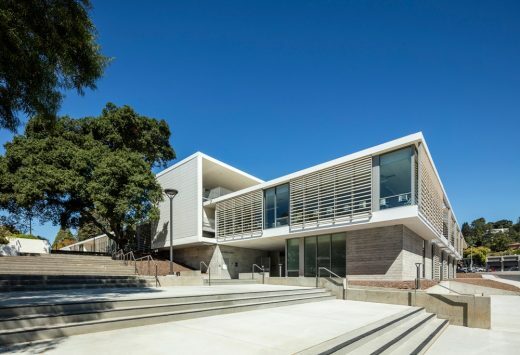 The new Academic Center has transformed the College of Marin’s Kentfield campus. The design thoughtfully engages three generations of buildings and landscape, to create a new sense of community, and a welcoming gateway to the campus. 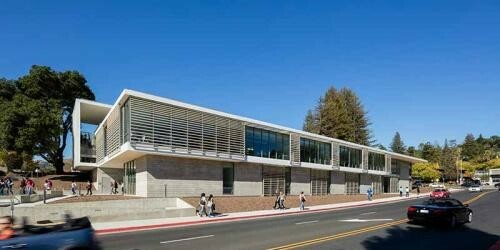 TLCD Architecture teamed with Mark Cavagnero Associates to create a signature building at the corner of Sir Francis Drake Boulevard and College Avenue, the last of the major projects in the College’s Measure C Bond program. 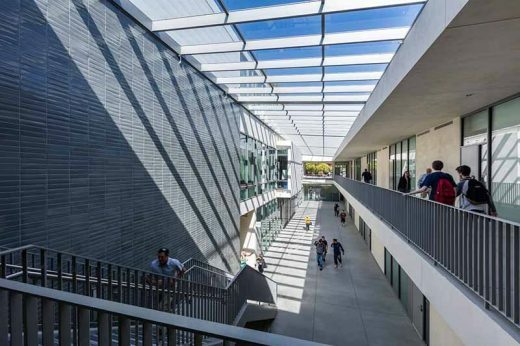 The 43,000-square-foot building includes administrative space, 16 classrooms, two computer labs, an ESL lab, and a 100-seat lecture hall. 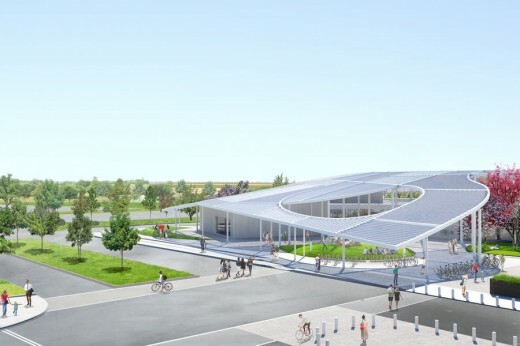 The Center is expected to receive a LEED Silver certification based on its energy efficiency and use of sustainable materials. 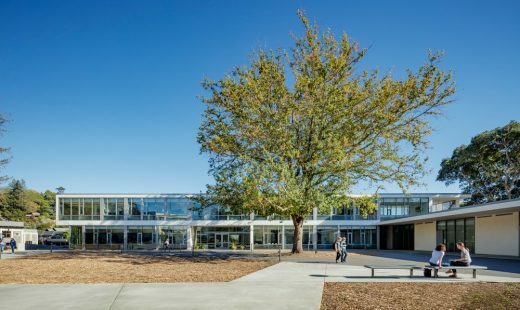 Built on a sloping and wooded site, the building blends gracefully into the campus contours, respecting the scale of the surrounding residential and commercial context. Dozens of specimen and heritage oak and redwood trees were preserved throughout the building site. 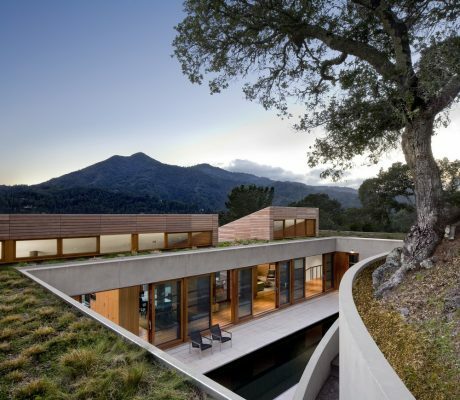 The building design emphasizes daylight and transparency, and features a large skylit central atrium that is naturally ventilated. Daylight control and shading is enhanced by ceramic “baguettes”, which also provide a linear texture to the building exterior. The development of the project design included extensive outreach to the College stakeholders and the local community. 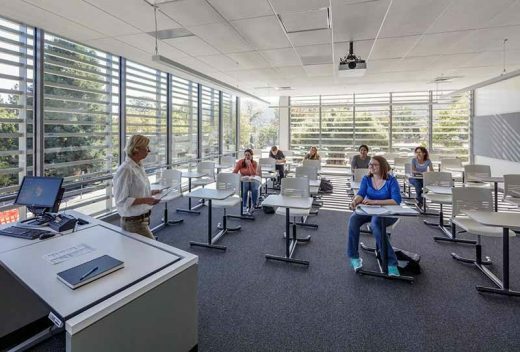 The building has been well received, especially by the students and faculty that can now experience collaborative learning in a healthy, comfortable environment that features the latest technology.